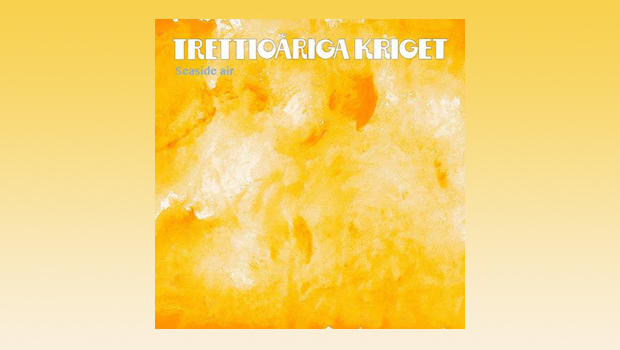 I first came across Trettioåriga Kriget with their 2011 album Efter Efter, to which Seaside Air is the follow-up. The five year interval may be significant but the time has been well spent and fans of the band are sure to be enthused by this new release. With just a few early line-up changes since their inception in 1970, Trettioåriga Kriget provide a satisfyingly authentic sound with all of the current band members being present in their ’70s heyday, keyboardist Mats Lindberg being the ‘new boy’ having only joined in 1977! There is a particularly ‘in-house’ feel to Trettioåriga Kriget with original members Olle Thörnvall and Johan Gullberg moving from the stage to background roles in the early ’70s, Thörnvall to become the band’s lyricist and Gullberg providing cover artwork. Both still hold these roles today. After splitting in 1981 there were a couple of reunions before a full reformation in 2004 which led to the trilogy of albums up to and including Efter Efter that formed a Trettioåriga Kriget autobiography. Most of the music for Seaside Air was written by bassist Stefan Fredin, Thörnvall’s lyrics for the first time entirely in English which should hopefully ensure a wider interest in the music of this singularly fine band. Once again there is an element of nostalgia to Seaside Air, well named as it is both a bracing listen and because much of it looks back to the early years of the band in the resort town of Saltsjöbaden, south of Stockholm, the first four tracks forming a mini-suite with autobiographical roots. Opener The Photograph sets out the lay of the land nicely with a strident guitar part that alternates with a typically Swedish and ’70s influenced Mellotron figure. After the galloping intro, calm is restored with the warm and resonant vocals of Robert Zima, his accented delivery adding to the Scandinavian aura while the English lyrics open up the meaning. The extended instrumental section sees the guitar take on a ’60s influence with heavier wah-wah effects and overall The Photograph is an attention grabbing start that underlines what is so good about this band; it is multi-layered, intriguing and very well put together. The widescreen intro to the title track collapses in on itself to a claustrophobic verse, the Mellotron adding depth while stabs of guitar open the sound out again as the track becomes a journey of childhood adventures at the seaside and a growing interest in making music. The suite continues with Forgotten Garden which is beautifully observed and delivered with a delicacy to the heaviness that not many bands could pull off, but Trettioåriga Kriget are capable of changing direction and tone almost instantaneously which gives their music a wonderful dynamic range. Snow, with music by Fredin and Lindberg, has a cold edge and an expansive feel, the warmth of those safely indoors and gathered around the fire palpable as they shelter from the blizzard – but all is not well. The lyrics are particularly descriptive and an excellent fit with the music. Dag Lundquist’s Billy continues the underlying theme, initially with a ’60s jangliness (that unexpectedly reminded me of shoegazing supremos Ride) as it asks what happened to the protagonist since the long lost days where he could be found around the docks in Liverpool, haunting Mellotron adding a sense of loss as the question is left unresolved. Guitarist Christer Åkerberg’s Dreaming of Vermeer is a bright and uplifting acoustic piece, with gorgeous lyrics amidst parred down instrumentation of guitar, violin and voices it makes for an interesting diversion and adds to the variety. The tie everything up it’s a full scale rock number in Behold the Pilot, and a thumping finish it is too, ending with an a capella section that culminates with Zima delivering the final line alone. These guys certainly play off each other beautifully and the results are superb. I’m guessing that they’re a cracking live outfit. Seaside Air is sharp and focused but with the relaxed feel of a band clearly enjoying the creative process of producing new music. There is warmth and an enthusiastic vibe with energy to spare, the combined talents focused on producing a worthy successor to their illustrious back catalogue. It is all very accessible, possibly made more so by the English lyrics, packed with melodic highlights amongst the complex arrangements. An engaging album of ’70s influenced music steeped in Mellotron flavours, Trettioåriga Kriget are the masters of their own sound, rather than being slaves to the work of others, and have successfully brought their music into the present with a superb run of reformation albums in the new millennium.